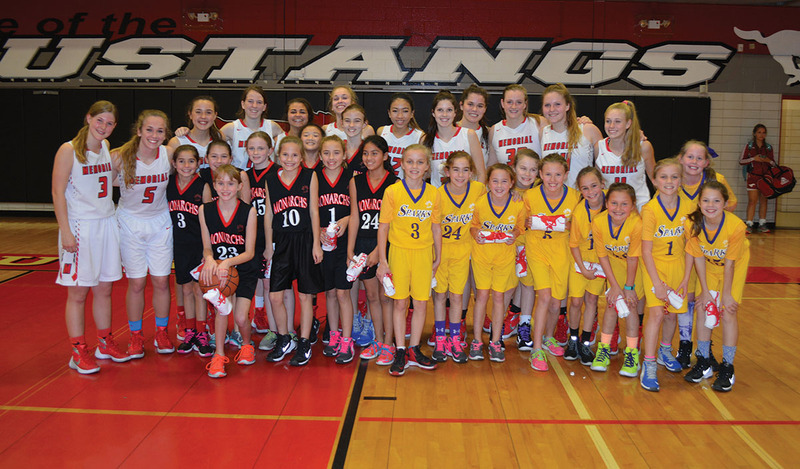 The Spring Branch-Memorial Sports Association’s 10U Sparks and Monarchs basketball teams faced off in an exhibition game during halftime at the Memorial High School varsity girls’ game. The high school players sat on the bench with the young girls and gave them commemorative T-shirts after the game. The varsity Mustangs are (from left) Becca Coker, Kelsey Slattery, Emma Shields, Grace Yochum, Giuliana Madrigali, Courtney Slattery, Rachel Lai, Claire Tate, Elizabeth Eubank, Amanda McCloskey, Jordan Kreindler and Sydney Gauss. The SBMSA Monarchs are (from left) Paige Shepard, Deveny Gilmore, Ava Swartz, Jill Haugen, Claire Shea-han, Ali Wigle, Megan Medlenka, Eleanor McWilliams and Angie Aguilar (not pictured: Valerie Igbikiowubo). The SBMSA Sparks are (from left) Sloane Soriero, Cameron Kroger, Lauren Wray, Kate Marshall, Peyton Ralston, Riley McCloskey, Kylie Gilchrist, Brooke Soriero, Emily Milner and Lily McClanahan.